Technology Research’s Surge Guard 34850 is one of those RV accessories that you don’t want to plop down the big bucks for, but it really is a must have item to protect your RV. It’s not very glamorous, it’s pricey, but you gotta have it. The Surge Guard 34850 plugs into the power pedestal where you would normally plug your RV power cord. You then plug your RV power cord into the Surge Guard. Once it’s connected, it provides continuous monitoring of the campground’s voltage (high / low), improper ground, and reverse polarity. If it detects any problems with the campground’s power, it will immediately shutoff power to your RV. It’s also a sacrificial surge/spike protector … a very expensive sacrificial surge/spike protector, but one you will love if it ever saves your coach from a spike. Most people put surge protectors on their expensive electronics throughout their house. Think of the Surge Guard 34850 as a surge protector for your entire RV. When you think of it like that, it becomes clear this is a good purchase. It not only protects your RV’s electronics, but it also protects all your plugged in electronics like TVs and computers. The Technology Research’s surge guard comes in 30amp and 50amp models. 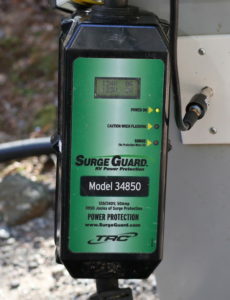 The Surge Guard 34850 is their 50amp model and is the one we purchased. It will work with any travel trailer, 5th wheel, or motorhome that uses 50amps. If your RV uses 30amps, you’ll have to get their 30amp model, the Surge Guard 34830. Some additional features that we really like are … The surge guard will turn off power to the RV if it detects the campground receptacle is overheating. If there is a power failure and then the power comes back on, the Surge Guard 34830 will delay turning on the RV’s power for 128 seconds. This is to protect your A/C’s compressor from quickly cycling power which can damage it. Also, you can check your RV’s voltage and amp draw using the small LCD panel. And finally, each plug of the surge guard has a pop out handle that helps you disconnect the plugs and that helps to reduce curse words. The Surge Guard 34830 is not a cheap device, but it has saved our butts on more than one occasion. We really like having the external model as opposed to the model that is hard wired directly into your coach. If our Surge Guard ever blew, we would simply order a new one, but if you have a hard wired model, you will have to hire an electrician to install the replacement. Also, in a pinch, we can take our Surge Guard out of service and plug the RV directly into the campground’s power pedestal. If you have a hard wired model, you don’t have this option. I do wish the surge guard had a built in security method that would allow you to easily lock it to the power pedestal or at least a method of securing your own lock and cord directly to it. We have never had anything stolen from us, but we’ve been told this is a theft item. All in all, we are very happy with the Technology Research’s Surge Guard 34850. Ours has been in service for over a year without any issues and it gives us peace of mind knowing that it is protecting our RV and all the electronics we have inside.